From the Department of Family Medicine, University of Michigan, Ann Arbor (JMM); the Department of Family and Community Medicine, Michigan State University, East Lansing (RAM); the Center for Data Management and Translational Research, Michigan Public Health Institute, Okemos (IS, GMG, CT); the Michigan Care Management Resource Center, University of Michigan, Ann Arbor (MB); and MiPCT, University of Michigan, Ann Arbor (DB-M, AF). 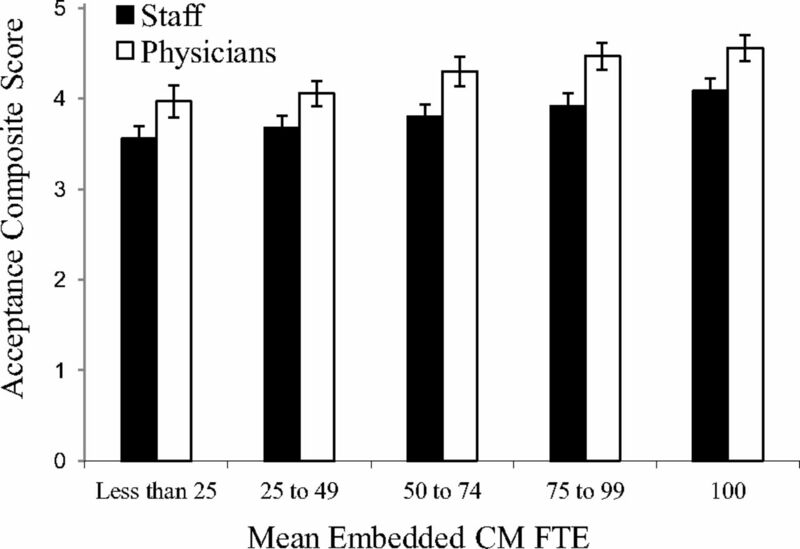 Adjusted mean acceptance scores by level of CM FTE embedment derived from separate analyses for physicians and staff. Error bars represent standard error of the mean. CM = Care Manager; FTE = Full Time Equivalent. ↵* Distributed approximately normally and treated as a continuous variable in the analysis. CM, care manager; EHR, electronic health record; FTE, full-time equivalent; NA, not applicable. ↵* All items were scored on a scale of 1 to 5. CM, care manager; MiPCT, Michigan Primary Care Transformation; SD, standard deviation. Practice was treated as a random effect in the model. Boldface indicates a significant association at P < .05.